Atrophic glossitis is a condition characterised by absence of filiform or fungiform papillae on the dorsal surface of the tongue. Consequently, the ordinary texture and appearance of the dorsal tongue, determined by papillary protrusion, turns into a soft and smooth aspect. Throughout the years, many factors, both local and systemic, have been associated with atrophic glossitis as the tongue is currently considered to be a mirror of general health. Moreover, various tongue conditions were wrongly diagnosed as atrophic glossitis. Oral involvement can conceal underlying systemic conditions and, in this perspective, the role of clinicians is fundamental. Early recognition of oral signs and symptoms, through a careful examination of oral anatomical structures, plays a crucial role in providing patients with a better prognosis. Keywords: Atrophic tongue, Gastrointestinal disease, Infections, Nutritional deficiency, Systemic conditions. Due to its proximity to the respiratory tract and its continuity with gastrointestinal system, as well as its participation in speech articulation, the oral cavity assumes a crucial role in many physiologic processes [1, 2]. Additionally, a great variety of systemic disorders have been associated with specific or nonspecific oral changes and, in many circumstances, the oral cavity becomes an important diagnostic area. Oral involvement may precede systemic manifestations and symptoms, providing clinicians with early diagnosis of an underlying condition. In particular, its careful examination can reveal signs and symptoms of metabolic disorders, endocrinopathies, gastrointestinal diseases, hematologic, autoimmune, and neoplastic pathologies [1, 3]. From this perspective, the systematic investigation of the oral mucosa and the dorsum of the tongue appears fundamental. Any variation of oral anatomical structures may be indicative of a systemic disease and should be thoroughly investigated. However, in order to generate differential diagnoses, since the aetiology of many oral conditions remains unknown, defining a univocal classification system is still arduous and clinicians should firstly discern local and generalized systemic conditions [1-5]. Afterwards, having collected all clinical findings and formed a first opinion, clinicians should determine what additional tests might be necessary before establishing the definitive therapy. This article focuses mainly on local and systemic conditions associated with atrophy of the dorsum of the tongue, currently considered a potential indicator of general health. At the same time other tongue conditions, determining a clinical aspect similar to a atrophic glossitis, will be examined in order to give a guidance to the differential diagnosis In this context, the differential diagnosis between primary atrophic glossitis and the conditions related to atrophic. tongue appears indispensable. The ordinary texture and appearance of the dorsal tongue are related to the protrusion of a large number of papillae, which are responsible for the roughness of the surface, (Fig. 1). Absence of filiform or fungiform papillae on the dorsal surface of the tongue produces a soft and smooth aspect, known as atrophic glossitis (AG) . Fig. (1). Graphical representation of the tongue in physiological conditions. (A. Vallate papillae, B. Foliate papillae, C. Filiform papillae, D. Fungiform papillae). Throughout the years, numerous factors have been taken into consideration for the aetiology of AG. In particular, papillary atrophy has been correlated to both local and generalized systemic conditions. Local lesions are more often attributed to congenital or developmental affections, infections, neoplasia; or they may be idiopathic. Lesions of systemic origins are more frequently associated to metabolic disorders, blood dyscrasias and immunological diseases [6, 7]. AG can also be correlated with protein deficiency and a hypocaloric diet; as well as deficiency of iron, vitamin B12, folic acid, riboflavin, and niacin [3, 8, 9]. A literature search was done to identify all reports specifically regarding a condition of atrophy of the papillae of the tongue, regardless of their publication status. Medline, Pubmed and Cochrane Library were searched systematically for all published literature from January 1975 (year of the first published paper regarding the AG) to April 2016, which included the following terms in their titles, abstracts, or keyword lists: atrophic glossitis, benign migratory glossitis and median romboid glossitis. Reviews, case reports, editorials, letters and commentaries were excluded, as well as articles lacking an abstract preview or not written in English. The search strategy generated 50 records for the AG, 297 records for the benign migratory glossitis and 83 records for the median romboid glossitis. After application of the inclusion/exclusion criteria and the analysis of full-text articles, 40 records were discarded for AG, (Fig. 2), 278 for the benign migratory glossitis and 69 for the median romboid glossitis. Finally, 10 studies for the AG, 19 studies for the benign migratory glossitis and 14 studies for the median romboid glossitis were chosen to write the review. Due to the lack of articles that specifically deal with the subject of this review, most of the data were taken from publications in which the observation of tongue atrophy condition was secondary to the main outcome of the work. Additional sources were hand-searched, including: bibliographies from previous reviews on the subject, bibliography of all publications cited in these articles and chapter from various English textbooks regarding the oral pathology. Fig. (2). Study flow chart. The tongue is continuously exposed to chemical, mechanical and physical stimuli that, when too strong or chronic, may cause atrophic lesions. Among these kind of aetiological factors are alcohol abuse, traumas and drug collateral effects. At the same time, an incorrect diet with nutritional deficiency can determine atrophy of the dorsum of the tongue leading to a diagnosis of AG. Typically AG is not a physiological condition; despite this, it has been associated with another tongue disease such as the fissured tongue, also in the absence of a systemic disease . Fissured tongue is typically associated with aging and is considered the most common lingual defect with a prevalence of 5-11% [2, 5, 10-13]. The principal clinical manifestation of this condition, that is not always associated with an atrophy of the lingual dorsum, is the presence of grooves with varying degree of depth along the dorsal surface of the tongue [10, 14]. The fissured tongue is usually asymptomatic, unless a secondary inflammation was determined by a low-grade infection, bacterial overgrowth or trapped food debris. Other than being correlated with older age, this is a condition observed in patients affected by Down's syndrome, Acromegaly, Sjogren syndrome, Psoriasis and Melkersson-Rosenthal syndrome [2, 5, 12]. The association of nutritional deficiencies and AG was first described in 1975 in the first US National Health and Nutritional Examination Survey, and it is considered the principal aetiological factor determining the atrophy of the tongue mucosa [2, 5, 15]. Deficiency of various nutrients, usually several of them rather than one at a time, is described to be correlated with AG [9, 16-19] (Table 1). Those recognised are riboflavin (vitamin B2), niacin (vitamin B3), pyridoxine (vitamin B6), folic acid (vitamin B9), cobalamin (vitamin B12), iron and zinc [2, 5, 8, 9, 16, 17, 20-31] (Table 2). Lately, mechanisms involving cellular oxygenation and/or the iron concentration in tongue's cells have been associated to AG due to nutritional deficiencies. Deficiency of each one of the nutrients listed above determines one of the conditions described, with a direct or an indirect mechanism (poor diet, malabsorption, excessive consumption). Table 1. Literature analysis of articles focused on AG related to nutritional deficiency. Table 2. Nutrients associated with the determination of an AG. Gastrointestinal diseases are the most common conditions associated with the development of an atrophy of the tongue's mucosa related to a nutritional aetiology. Among them, celiac disease (CD) is considered one of the main causes in determining the nutritional deficiencies described above . Celiac disease is caused by an autoimmune intolerance to gliadin, a protein contained in gluten [32, 33]. The main target of this intolerance is represented by the mucosa of the small intestine, with the development of histological lesions characterized by various degrees of villous atrophy, crypt hyperplasia, damage to the surface epithelium, an increased number of lymphocytes and other inflammatory cells in the lamina propria [7, 32-34]. This causes poor absorption of nutrients determining a deficiency of vitamin B12, folic acid and iron . Tongue lesions related to celiac diseases are identified as indirect symptoms. The AG associated with celiac disease, when accompanied by other signs or symptoms, has been recognized as a warning sign of the underlying intestinal pathology [2, 4, 7, 34-37]. Pastore and Lo Muzio highlighted the importance of the recognition of AG to obtain the diagnosis of a celiac disease. The authors cited the National Institutes of Health consensus statement on celiac disease: “the single most important step in diagnosing celiac disease is to first consider the disorder by recognizing its myriad clinical features” [6, 38]. AG has also been described as the only clinical sign leading to suspect the diagnosis of celiac disease . In 2014, a paper by Park JM et al. described a case of Plummer-Vinson syndrome associated with Crohn's disease. Further works will be needed to confirm this data . Alcoholic tongue atrophy can be related to two possible explanations: the status of malnutrition that characterises alcohol abusers or a direct chemical damage to the tongue mucosa [25, 40]. Malnutrition is a typical condition of an alcoholic patient. A lack of vitamin B12/A vitamin B12 deficit in particular is usually a sign of this malnutrition. This contradiction is due to an alteration in hepatic enzyme levels, meaning that patients can show symptoms or signs of vitamin B12 deficiency even if its levels are normal . In 2012, Cunha S.F. et al analysed papillary atrophy of the tongue and nutritional status of hospitalized alcoholics . They observed a statistically significant correlation between atrophic glossitis and reduced anthropometric measures, anemia and hypoalbuminemia. They also identified alterations in serum levels of vitamins A, E and B12, but were not been able to determine a correlation with an atrophic condition of the tongue . Direct damage of tongue tissues caused by alcohol has been analyzed by several authors. In 1985, Valentine J.A. et al. observed the effects of alcohol and tobacco abuse on tongue mucosa in order to identify the alteration in the lingual epithelial structure in an antitumor evaluation . The authors studied the histology of 161 tongue specimens taken from corpses of patients with a history of abuse of alcohol within 5 years before death. Their results showed that epithelial atrophy was frequently present on the lingual dorsum, with an increase in basal cells size and also a decrease in superficial cells . In 1994, Maier H. et al. investigated the role of alcohol as co-carcinogen. Alcohol consumption determined a reduction of epithelial thickness associated to increased cellular proliferation in the basal layer. Alcohol determined a cytotoxic effect, with atrophy of the oral mucosa followed by an hyper-regeneration. All these effects have been associated with an increased susceptibility to carcinogenic substances [44, 45]. Drugs determine an AG through several different mechanisms. The AG could derive from drug usage principally in an indirect way, or as a symptom or consequence of a specific adverse reaction to a drug therapy [46, 47]. In fact, specific medicaments can determine a vitamin deficiency that leads to an AG through the mechanisms previously explained. The drugs with an adverse reactionleading to this kind of consequence are very different. It is possible to find drugs for the treatment of type 2 diabetes, contraceptives, acid-lowering agents, anti-cancer medicaments, agents for the treatment of hypertension, neurologic drugs as well as others [28, 48-66] (Table 1). Each one of them could generate an AG related to a vitamin deficiency through two principal mechanisms of action: firstly, they can determine a malabsorption of the nutrient; secondly, they can interfere in the metabolization of a specific vitamin. In addition, there are other mechanisms leading to an atrophic condition such as the development of candidiasis after antibiotic use, xerostomia related to antidepressant consumption or microcirculation alteration after use of chemotherapeutical drugs [67-73]. In addition, a review from 2012 described as a tongue dysesthesia can also be associated with multitargeted tyrosine kinase inhibitors (TKIs) and mammalian target of rapamycin inhibitors (mTORIs) . 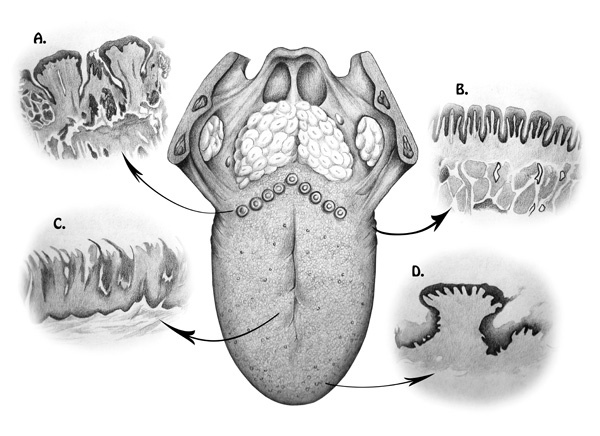 Tongue crypts, along with tonsils and gingival sulcus, are considered important ecological niches of the oral cavity . In these areas the balance between the environment and oral microorganisms is frail, and regulates the maintenance of the oral ecosystem equilibrium preventing environmental changes [76-78]. The tongue dorsum is always colonized by various microbial colonies without the development of a pathological condition. When the balance of the niches is altered, it is often possible to observe a pathological colonization due to a specific, and often single, microbial strain accompanied by clinical manifestations. Atrophic condition of the tongue has been described in association with candidiasis, colonization of Helicobacter pylori and as consequence of Treponema pallidum infection [2, 12, 79-81]. Candida albicans (C. albicans) is one of the normal components of microflora of the oral cavity, with a prevalence between the 30 and the 50% . The development of an oral candidiasis is usually related to an imbalance of the normal oral microbial ecosystem. Determinants of an oral candidiosis are: long-term antibiotic therapy, use of local steroids (i.e. inhaler or mouthwashes), immunodeficiencies (i.e. AIDS, organ transplant, chemotherapy) or favourable environmental conditions (i.e. xerostomia, poor oral hygiene, diabetes) [83-86]. Candida infection promotes different clinical manifestations on the tongue surface, both acute and chronic. Among them, chronic erythematous candidiasis determines an atrophic lesion defined as median rhomboid glossitis [5, 70], while an acute erythematous candidiasis can promote an a specific AG . Helicobacter pylori (H. pylori) is a Gram-negative, microaerophilic bacterium identified among etiologic factors contributing to chronic gastritis and gastric ulcers . Its presence in oral plaque and saliva is controversial, in several studies prevalence fluctuated from 0 to 100% [88-91]. In 2001, Gall-Troselj et al. examined the possible role of H. pylori in determining an AG and the burning mouth syndrome . They examined 87 patients with an AG looking for the presence of H. pylori by cytobrash of the dorsal tongue mucosa. Their results showed a high prevalence of the bacteria of tongues in patients affected by the AG (16%) compared with healthy controls (0%). This statistically higher incidence lead the authors to suspect that H. pylori colonization could have been secondary to the development of the AG, and not its causative agent. They hypotized a change in salivary flow and/or salivary content prior to the development of the AG . Treponema pallidum is an anaerobic spirochete causing the sexually transmitted systemic disease named syphilis. Oral manifestations are uncommon but can be present in all the three stages of the disease. The importance of mouth examination for the diagnosis has been recognized long ago . The review analyzing the literature from 1950 to 2011 about oral manifestation of syphilis, determined the atrophic condition of the tongue as the sign of a secondary and tertiary stages of the disease. In particular, tongues were shown to be affected in 37% of cases, while the prevalence of the atrophic conditions is not clear . An atrophic condition of the tongue can be related to a systemic disorder that leads to nutritional deficiency, with the determination of an AG as described in 2.2. section, to direct damage following autoimmunity mechanisms or through neoplastic degeneration that brings to an atrophic aspect of the tongue, but that doesn't determine a diagnosis of AG. There are several other systemic conditions or pathologies that can lead to the formation of an atrophic aspect of the tongue, not always classifiable as AG: autoimmune diseases, pre-neoplastic and neoplastic conditions, direct damage, genetic pathologies and metabolic disorders [1, 3, 12]. Gastroesophageal reflux disease (GERD) is a pathological condition typically represented by the regurgitation of gastric acid with damage to the esophagus. Symptoms of GERD are distinguished into classic and extra-esophageal, the latter being the only symptoms in about fifty percent of cases . Oral signs can be distinguished on the basis of their aetiological cause. Direct damage provoked by gastric acid reflux from the stomach is represented mainly by dental erosions . Mucosal damages, in particular on the palatine mucosa, are often described as hyperaemic, erythematous areas along with an alteration in salivary gland functions. Atrophic lesions of the tongue are frequently described in association with GERD. It is often difficult to determine if they are a direct consequence of the acid ph or if they are secondary to the alteration of the saliva (often with a xerostomic condition) leading to infection (e.g. candidiosis) or, more frequently, originating from drug administration (see Table 3) [95, 96]. Table 3. Drugs that could be related to the development of an atrophic condition of the tongue. Lichen planus is a chronic dermatologic disease that often affects the oral mucosa with two clinical manifestations: reticular and erosive [3, 97, 98]. Erosive lichen is less common than the reticular one, but it is clinically more important because is often symptomatic. The lesion appear as atrophic, erythematous areas with central erosion of varying degrees [3, 97, 98]. The tongue, the third or fourth oral site are more frequently involved after the buccal mucosa, lower lip and, sometime, the gingiva . It is suggested to perform a biopsy in cases in which diagnosis is doubtful (Fig. 3). Squamous cell carcinoma of the tongue is the cancer more frequently diagnosed in the oral cavity, with an incidence between 25 and 40% . This condition is strictly related to the abuse of tobacco and alcohol, and more frequently involves the lateral surface of the tongue [2, 100, 101]. Cancer of the tongue clinically appears as a nodular or ulcerated lesion frequently associated with pain and discomfort. In the premalignant phase, the tongue shows a red or white lesion that leads to the diagnosis of an erythroplakia or a leukoplakia . The erythroplakia is a condition that can determine a misdiagnosis of AG, with the risk of delayed recognition of the tumour [2, 12]. A biopsy is fundamental for the correct diagnosis and subsequent therapy . Fig. (3). Tongue lesion related to lichen planus (histological diagnosis). First described in 1949 by Conrad Milton Riley and Richard Lawrence Day, this disorder is an autosomal recessive neuropathy of the autonomic nervous system [103, 104]. It is characterised by decreased deep tendon reflexes, impaired perception of temperature and pain, lack of an axon flare following intradermal histamine injection, labile blood pressure and absence of fungiform and filiform papillae in the tongue [5, 12, 105]. This pathology exclusively affects Ashkenazi Jewish children, and presents several oral signs with high rates of dental trauma and self-mutilations. AG represents the most important oral sign that can lead to a suspicion of the underlying syndrome and is based on a degenerative condition caused by a local autoimmune reaction . Psoriasis is a skin and joint disease affecting between 1 and 2% of the population of the United States . The clinical pattern is represented by an increased proliferation of keratinocytes due to an autoimmune reaction, with activation of T lymphocytes, abnormal production of cytokines, altered molecular adhesion, chemotactic mechanisms and grow factors productions . Specific oral lesions have been associated with this pathology. In particular, fissured tongue and geographical tongue have been observed as consequence of the immunological disorder . Oral mucosal lesion may be associated with psoriasis, but it is not clear if these can be considered pathognomonic of this systemic disease . Epidermolysis bullosa (EB) is a rare genetic disorder represented by various and different subtypes, all based on a fragility of skin and mucosal membranes with the development of blisters and atrophic areas. A strong association between this systemic disease and tongue affections has been described. More than the 50% of patients involved in a study presented AG in various degrees of severity, so that the tongue has been considered the most affected oral site in patients with diagnosed EB . Lingual involvement has also been described by other authors, confirming that the lingual dorsum is the oral site with the most frequent manifestations. Unfortunately, oral lesions are not pathognomonic of EB or of EB sub-types [108-110]. It is hypothesized that the high prevalence of tongue affection can be explained by its size, function and position, so that it is constantly exposed to the risk of traumas . The Melkersson-Rosenthal syndrome (MRS) is a rare granulomatous disease characterised by vesicles, lymphangiomas, facial paralysis and fissured tongue [3, 111, 112]. Tongue lesions were described in a large number of patients, arriving up to 75% in a study by Feng et al. In the MRS there is an alteration of the microcirculation, in addiction to food intolerance determining malabsorption [113-116]. The tongue can develop fissures, edema, paresthesia, erosions or taste alteration [3, 111, 112]. For the reasons explained previously, in addition to the therapy with corticosteroid, clinicians often suggest a specific diet, with the addition of B vitamins. Therefore, the application of tests to determine food allergies will make it easier to identify and eliminate particular foods from a given patient’s diet . Diabetes mellitus is a disease that causes an alteration in the production of insulin or that determines a tissue resistance to insulin effects . It is divided into two different clinical patterns (Type I and type II). Only type I diabetes is related to oral manifestation through autoimmune aetiology. Oral manifestations are periodontitis, diabetic sialoadenosis, oral candidiasis, xerostomia, fissured tongue and benign migratory glossitis [3, 14, 117-119]. Candida infections, in particular the development of a median rhomboid glossitis, are strongly associated with diabetes mellitus, with an incidence up to 30% of patients [3, 70, 79]. Fissured tongue and benign migratory glossitis were described as common finding in diabetic patients, but a definite correlation has never been recognized [3, 117, 120, 121]. The diagnosis of an atrophic condition of the tongue is complicated by the similar, local expression of different clinical presentations. It is usually composed of three different clinical patterns, such as atrophic glossitis, geographic tongue (benign migratory glossitis) and the median rhomboid glossitis (Table 4). Table 4. Summary of the different kind of atrophic disease of the tongue. Fig. (4). Atrophic glossitis related to a celiac disease (histological diagnosis). Reamy et al. in 2010 described this clinical as: “Atrophic glossitis is also known as smooth tongue because of the smooth, glossy appearance with a red or pink background. The smooth quality is caused by the atrophy of filiform papillae ,” (Fig. 4). As previously described, the real AG is typically related to a nutritional deficiency status. The lack of vitamin intake can be associated with a poor diet or with a systemic disease. In both cases a blood sample is necessary to identify an alteration in hemoglobin, iron, folic acid and vitamin B group and homocysteine levels, in addition to gastric parietal cell antibody positivity [9, 18, 19, 122]. It can also be useful to perform antigliadin, tissue transglutaminase and the IgA-endomysial antibody tests, and a microbiological analysis of tongue surface [7, 18]. Sometimes, the absence of symptoms makes the diagnosis more difficult because patients are often non-compliant with all the required exams. This disease has been defined as: “[...] the dorsal tongue develops areas of papillary atrophy that appear smooth and are surrounded by raised serpiginous borders. These regions of atrophy spontaneously resolve and migrate, giving the tongue a variegated appearance .” The diagnosis of this condition is easy, because of the tendency of the lesions to change and “move” throughout the day. Two repeat visits in 12-24 hours and a microbiological examination to rule out a Candida infection, will help in identifying with sufficient certainty the disease without the need for further tests [12, 79, 123]. It is often impossible to alleviate patients’ burning sensations. A simple search for nutritional deficiencies is strongly recommended . This pathology is described as “[...] a smooth, shiny, erythematous, sharply circumscribed, asymptomatic, plaque-like lesion on the dorsal midline of the tongue ,” (Fig. 5). Clinically it can be asymptomatic or it can determine pain or burning sensation. The aetiology of this disease is controversial, but it is usually considered as a clinical variant of a candida infection. A microbiological analysis of tongue surface and a thorough anamnesis are key to diagnosis . The tongue can be considered as a mirror of oral and/or systemic health. An oral medicine expert can be the first to observe the lingual status, and should be familiar with the different diagnoses of these conditions, for example being able to link lingual abnormalities with specific etiologic causes. Recognition of alterations relative to tongue’s morphology, in the presence of a negative anamnesis, should lead to more accurate investigations, in order to ascertain if they are manifestations of an underlying systemic condition [1, 12]. Fig. (5). Median rhomboid glossitis (Microbiological diagnosis). Among tongue diseases, AG has the most complex differential diagnosis, because it is associated with several conditions. Atrophy of the filiform papillae, not directly attributable to mechanical damages of the mucosa, can occur in systemic or local conditions. Although seemingly simple, sometimes the recognition of a “real AG” can be very hard. Many local conditions, such as median rhomboid glossitis, of glossite migrans, mediated by infective and idiopathic etiological factors, as well as neoplastic or congenital factors, can complicate the diagnosis. Reamy et al. described and analyzed the most frequent lingual diseases, with a particular attention to the atrophic conditions . They summarized the etiologic conditions responsible for the development of AG; among them it was discovered that nutritional deficiencies and drug reactions are the most frequently encountered. Unfortunately, while drug interactions are almost always detectable with anamnesis, nutritional deficiencies can be related to various and different systemic conditions, and sometimes the etiological factor may be difficult to identify. A typical example is anaemia, in which the cause may be acute or chronic. In some circumstances, however, the outbreak of other symptoms in association with the casual discovery of tongue lesions, as in case of celiac disease, can be decisive for the diagnosis . The clinician has to identify the clinical and anamnestic conditions that will lead to the diagnosis of the AG and also identify a possible related systemic disease. During the first observation of the lesion it is necessary to apply a strict protocol to achieve the right diagnosis. First of all, after the anamnesis, the clinician has to identify if the lingual condition can be associated with medication taken by the patient (Table 2) or with some already recognised systemic disease (chapter 2.3). In case of a negative anamnesis, it is fundamental to verify if the AG changes during the 12-24 hours after the first observation in order to reject the hypothesis of a geographic tongue (chapter 3.2). If the lesion shows no variation in this time-span, the clinician needs to perform a microbiological analysis of the lingual dorsum to exclude or find a candida infection (that can be classified as primary or secondary to the AG). The presence of a candidiasis is not necessarily the diagnostic answer, because the AG can easily be infected by both local and systemic conditions. It is important to remember that the clinical picture associated with a primary candidiasis is the median rhomboid glossitis (chapter 3.3), while condition such as nutritional deficiencies, diabetes, xerostomia and ph alterations can easily lead to a secondary infection. Anyway, in case of positivity of the microbiological test, it is necessary to treat the infection and to revaluate the patient after the therapy, repeating the microbiological analysis in order to observe possible remission of the atrophic condition (in case of primary candidiasis). If the lesion is still observable after the antimicrobic therapy, or in case the microbiological test was negative, the clinician needs to evaluate specific blood tests (chapter 3.1). Following the results of the blood tests, the pathologist should be able to identify the aetiology of the atrophic condition and to treat it, or ask for a consultation. In the case of unknown or unidentified aetiology, the observation has to be repeated to identify the appearance of other signs (local or systemic). The early recognition of signs and symptoms relative to systemic conditions through careful analysis of oral anatomical structures appears essential in the perspective of achieving a better prognosis. Atrophic anomalies are related to several conditions, both local and systemic, that clinicians have to know and identify. For these reasons, knowledge of oral diseases and their aetiology is important, requiring a continuous professional education as well as interaction with other medical specialists when necessary. Authors are thankful to Laura Armosini for the picture on tongue anatomy. Islam NM, Bhattacharyya I, Cohen DM. Common oral manifestations of systemic disease. Otolaryngol Clin North Am 2011; 44(1): 161-82. Reamy BV, Derby R, Bunt CW. Common tongue conditions in primary care. Am Fam Physician 2010; 81(5): 627-34. Neville BW, Damm DD, Allen CM, Bouquot JE. Oral and Maxillofacial Pathology. 3rd ed. Natherlands: Elsevier 2008. Mansoor DK, Sharma HP. Clinical presentations of food allergy. Pediatr Clin North Am 2011; 58(2): 315-26. Byrd JA, Bruce AJ, Rogers RS III. Glossitis and other tongue disorders. Dermatol Clin 2003; 21(1): 123-34. Pastore L, Lo Muzio L, Serpico R. Atrophic glossitis leading to the diagnosis of celiac disease. N Engl J Med 2007; 356(24): 2547. 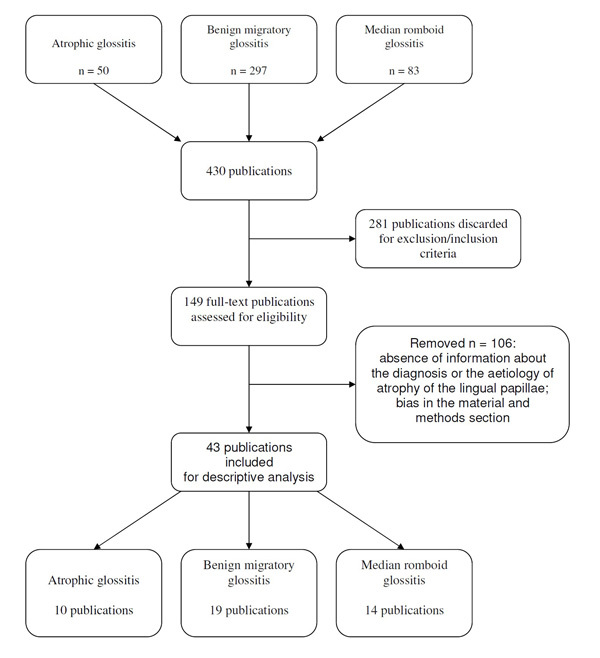 Erriu M, Canargiu F, Orrù G, Garau V, Montaldo C. Idiopathic atrophic glossitis as the only clinical sign for celiac disease diagnosis: a case report. J Med Case Reports 2012; 6(1): 185. Lehman JS, Bruce AJ, Rogers RS. Atrophic glossitis from vitamin B12 deficiency: a case misdiagnosed as burning mouth disorder. J Periodontol 2006; 77(12): 2090-2. Wu YC, Wang YP, Chang JY, Cheng SJ, Chen HM, Sun A. Oral manifestations and blood profile in patients with iron deficiency anemia. J Formos Med Assoc 2014; 113(2): 83-7. Madani FM, Kuperstein AS. Normal variations of oral anatomy and common oral soft tissue lesions: evaluation and management. Med Clin North Am 2014; 98(6): 1281-98. Bessa CF, Santos PJ, Aguiar MC, do Carmo MA. Prevalence of oral mucosal alterations in children from 0 to 12 years old. J Oral Pathol Med 2004; 33(1): 17-22. Rogers RS III, Bruce AJ. The tongue in clinical diagnosis. J Eur Acad Dermatol Venereol 2004; 18(3): 254-9. Lynge Pedersen AM, Nauntofte B, Smidt D, Torpet LA. Oral mucosal lesions in older people: relation to salivary secretion, systemic diseases and medications. Oral Dis 2015; 21(6): 721-9. Järvinen J, Mikkonen JJ, Kullaa AM. Fissured tongue: a sign of tongue edema? Med Hypotheses 2014; 82(6): 709-12. National Center for Health Statistics. Preliminary Findings of the First Health and Nutritonal Examination Survey, United States 1971-1972. Health Resourches Administration (Antropometric and clinical findings). In: DHEW Publication no. 75-1229; Washington DC. 1975. Drinka PJ, Langer EH, Voeks SK, Scott L, Morrow FD. Nutritional correlates of atrophic glossitis: possible role of vitamin E in papillary atrophy. J Am Coll Nutr 1993; 12(1): 14-20. Bøhmer T, Mowé M. The association between atrophic glossitis and protein-calorie malnutrition in old age. Age Ageing 2000; 29(1): 47-50. Sun A, Lin HP, Wang YP, Chiang CP. Significant association of deficiency of hemoglobin, iron and vitamin B12, high homocysteine level, and gastric parietal cell antibody positivity with atrophic glossitis. J Oral Pathol Med 2012; 41(6): 500-4. Sun A, Wang YP, Lin HP, Chen HM, Cheng SJ, Chiang CP. Significant reduction of homocysteine level with multiple B vitamins in atrophic glossitis patients. Oral Dis 2013; 19(5): 519-24. Prema K, Srikantia SG. Clinical grading of lingual lesions in vitamin B-complex deficiency. Indian J Med Res 1980; 72: 537-45. Pontes HA, Neto NC, Ferreira KB, et al. Oral manifestations of vitamin B12 deficiency: a case report. J Can Dent Assoc 2009; 75(7): 533-7. Vinther-Paulsen N. Glossitis and epithelial atrophy in old age; its relation to iron and vitamin B deficiency. Int Z Vitaminforsch 1952; 24(1-2): 148-54. Powers HJ. Riboflavin (vitamin B-2) and health. Am J Clin Nutr 2003; 77(6): 1352-60. Chawla J, Kvarnberg D. Hydrosoluble vitamins. Handb Clin Neurol 2014; 120: 891-914. López M, Olivares JM, Berrios GE. Pellagra encephalopathy in the context of alcoholism: review and case report. Alcohol Alcohol 2014; 49(1): 38-41. Wu XY, Lu L. Vitamin B6 deficiency, genome instability and cancer. Asian Pac J Cancer Prev 2012; 13(11): 5333-8. Zhang XH, Ma J, Smith-Warner SA, Lee JE, Giovannucci E. Vitamin B6 and colorectal cancer: current evidence and future directions. World J Gastroenterol 2013; 19(7): 1005-10. Briani C, Dalla Torre C, Citton V, et al. Cobalamin deficiency: clinical picture and radiological findings. Nutrients 2013; 5(11): 4521-39. Samad A, Mohan N, Balaji RV, Augustine D, Patil SG. Oral manifestations of plummer-vinson syndrome: a classic report with literature review. J Int Oral Health 2015; 7(3): 68-71. Prasad AS. Impact of the discovery of human zinc deficiency on health. J Trace Elem Med Biol 2014; 28(4): 357-63. Bao ZX, Yang XW, Shi J, Liu LX. Serum zinc levels in 368 patients with oral mucosal diseases: A preliminary study. Med Oral Patol Oral Cir Bucal 2016; 21(3): e335-40. Niewinski MM. Advances in celiac disease and gluten-free diet. J Am Diet Assoc 2008; 108(4): 661-72. Catassi C, Rätsch IM, Fabiani E, et al. Coeliac disease in the year 2000: exploring the iceberg. Lancet 1994; 343(8891): 200-3. Campisi G, Di Liberto C, Iacono G, et al. Oral pathology in untreated coeliac disease. Aliment Pharmacol Ther 2007; 26(11-12): 1529-36. Rashid M, Zarkadas M, Anca A, Limeback H. Oral manifestations of celiac disease: a clinical guide for dentists. J Mich Dent Assoc 2011; 93(10): 42-6. NIH consensus statement on celiac disease. NIH Consens State Sci Statements 2004; 21(1): 1-23. Park JM, Kim KO, Park CS, Jang BI. A case of plummer-vinson syndrome associated with Crohns disease. Korean J Gastroenterol 2014; 63(4): 244-7. Dong YJ, Peng TK, Yin SJ. Expression and activities of class IV alcohol dehydrogenase and class III aldehyde dehydrogenase in human mouth. Alcohol 1996; 13(3): 257-62. Himmerich H, Anghelescu I, Klawe C, Szegedi A. Vitamin B12 and hepatic enzyme serum levels correlate in male alcohol-dependent patients. Alcohol 2001; 36(1): 26-8. Cunha SF, Melo DA, Braga CB, Vannucchi H, Cunha DF. Papillary atrophy of the tongue and nutritional status of hospitalized alcoholics. An Bras Dermatol 2012; 87(1): 84-9. Valentine JA, Scott J, West CR, St Hill CA. A histological analysis of the early effects of alcohol and tobacco usage on human lingual epithelium. J Oral Pathol 1985; 14(8): 654-65. Maier H, Weidauer H, Zöller J, et al. Effect of chronic alcohol consumption on the morphology of the oral mucosa. Alcohol Clin Exp Res 1994; 18(2): 387-91. Ogden GR, Wight AJ, Rice P. Effect of alcohol on the oral mucosa assessed by quantitative cytomorphometry. J Oral Pathol Med 1999; 28(5): 216-20. Abdollahi M, Radfar M. A review of drug-induced oral reactions. J Contemp Dent Pract 2003; 4(1): 10-31. Abdollahi M, Rahimi R, Radfar M. Current opinion on drug-induced oral reactions: a comprehensive review. J Contemp Dent Pract 2008; 9(3): 1-15. Bilgili SG, Karadag AS, Calka O, Altun F. Isoniazid-induced pellagra. Cutan Ocul Toxicol 2011; 30(4): 317-9. Sato Y, Ouchi K, Funase Y, Yamauchi K, Aizawa T. Relationship between metformin use, vitamin B12 deficiency, hyperhomocysteinemia and vascular complications in patients with type 2 diabetes. Endocr J 2013; 60(12): 1275-80. Ko SH, Ko SH, Ahn YB, et al. Association of vitamin B12 deficiency and metformin use in patients with type 2 diabetes. J Korean Med Sci 2014; 29(7): 965-72. Niafar M, Hai F, Porhomayon J, Nader ND. The role of metformin on vitamin B12 deficiency: a meta-analysis review. Intern Emerg Med 2015; 10(1): 93-102. Long AN, Atwell CL, Yoo W, Solomon SS. Vitamin B(12) deficiency associated with concomitant metformin and proton pump inhibitor use. Diabetes Care 2012; 35(12): e84. Palmery M, Saraceno A, Vaiarelli A, Carlomagno G. Oral contraceptives and changes in nutritional requirements. Eur Rev Med Pharmacol Sci 2013; 17(13): 1804-13. Herrera I, Cisneros J, Maldonado M, et al. Matrix metalloproteinase (MMP)-1 induces lung alveolar epithelial cell migration and proliferation, protects from apoptosis, and represses mitochondrial oxygen consumption. J Biol Chem 2013; 288(36): 25964-75. Var C, Keller S, Tung R, Freeland D, Bazzano AN. Supplementation with vitamin B6 reduces side effects in Cambodian women using oral contraception. Nutrients 2014; 6(9): 3353-62. Jung SB, Nagaraja V, Kapur A, Eslick GD. Association between vitamin B12 deficiency and long-term use of acid-lowering agents: a systematic review and meta-analysis. Intern Med J 2015; 45(4): 409-16. Wiholm BE, Kelly JP, Kaufman D, et al. Relation of aplastic anaemia to use of chloramphenicol eye drops in two international case-control studies. BMJ 1998; 316(7132): 666. Verrotti A, Scaparrotta A, Grosso S, Chiarelli F, Coppola G. Anticonvulsant drugs and hematological disease. Neurol Sci 2014; 35(7): 983-93. Andrès E, Noel E, Goichot B. Metformin-associated vitamin B12 deficiency. Arch Intern Med 2002; 162(19): 2251-2. Varughese GI, Scarpello JH. Metformin and vitamin B12 deficiency: the role of H2 receptor antagonists and proton pump inhibitors. Age Ageing 2007; 36(1): 110-1. Kotilainen H, Lokki ML, Paakkanen R, et al. Complement C4 deficiencya plausible risk factor for non-tuberculous mycobacteria (NTM) infection in apparently immunocompetent patients. PLoS One 2014; 9(3): e91450. Rumsby PC, Shepherd DM. The effect of penicillamine on vitamin B6 function in man. Biochem Pharmacol 1981; 30(22): 3051-3. Hanai H, Iida T, Takeuchi K, et al. Nutritional therapy versus 6-mercaptopurine as maintenance therapy in patients with Crohns disease. Dig Liver Dis 2012; 44(8): 649-54. Sankrityayan H, Majumdar AS. Curcumin and folic acid abrogated methotrexate induced vascular endothelial dysfunction. Can J Physiol Pharmacol 2016; 94(1): 89-96. Halasz CL. Sulfasalazine as folic acid inhibitor in psoriasis. Arch Dermatol 1990; 126(11): 1516-7. Montalar M, Nalda-Molina R, Rodríguez-Ibáñez M, et al. Kinetic modeling of triamterene intestinal absorption and its inhibition by folic acid and methotrexate. J Drug Target 2003; 11(4): 215-23. Uher R, Farmer A, Henigsberg N, et al. Adverse reactions to antidepressants. Br J Psychiatry 2009; 195(3): 202-10. Scardina GA, Cacioppo A, Messina P. Changes of oral microcirculation in chemotherapy patients: A possible correlation with mucositis? Clin Anat 2014; 27(3): 417-22. Chaveli-López B. Oral toxicity produced by chemotherapy: A systematic review. J Clin Exp Dent 2014; 6(1): e81-90. Goregen M, Miloglu O, Buyukkurt MC, Caglayan F, Aktas AE. Median rhomboid glossitis: a clinical and microbiological study. Eur J Dent 2011; 5(4): 367-72. Kharazmi M, Persson U, Warfvinge G. Pharmacovigilance of oral bisphosphonates: adverse effects manifesting in the soft tissue of the oral cavity. J Oral Maxillofac Surg 2012; 70(12): 2793-7. Kumar NN, Panchaksharappa MG, Annigeri RG. Modified schirmer testa screening tool for xerostomia among subjects on antidepressants. Arch Oral Biol 2014; 59(8): 829-34. Kano O, Urita Y, Ito H, et al. Domperidone effective in preventing rivastigmine-related gastrointestinal disturbances in patients with Alzheimers disease. Neuropsychiatr Dis Treat 2013; 9: 1411-5. Boers-Doets CB, Epstein JB, Raber-Durlacher JE, et al. Oral adverse events associated with tyrosine kinase and mammalian target of rapamycin inhibitors in renal cell carcinoma: a structured literature review. Oncologist 2012; 17(1): 135-44. Suzuki N, Yoshida A, Nakano Y. Quantitative analysis of multi-species oral biofilms by TaqMan Real-Time PCR. Clin Med Res 2005; 3(3): 176-85. Zarco MF, Vess TJ, Ginsburg GS. The oral microbiome in health and disease and the potential impact on personalized dental medicine. Oral Dis 2012; 18(2): 109-20. Mager DL, Ximenez-Fyvie LA, Haffajee AD, Socransky SS. Distribution of selected bacterial species on intraoral surfaces. J Clin Periodontol 2003; 30(7): 644-54. Terai H, Shimahara M. Atrophic tongue associated with Candida. J Oral Pathol Med 2005; 34(7): 397-400. Pili FM, Erriu M, Piras A, Garau V. Application of the novel method in the diagnosis and treatment of median rhomboid glossitis Candida-associated. Eur J Dent 2014; 8(1): 129-31. Gall-Troselj K, Mravak-Stipetić M, Jurak I, Ragland WL, Pavelić J. Helicobacter pylori colonization of tongue mucosaincreased incidence in atrophic glossitis and burning mouth syndrome (BMS). J Oral Pathol Med 2001; 30(9): 560-3. Singh A, Verma R, Murari A, Agrawal A. Oral candidiasis: An overview. J Oral Maxillofac Pathol 2014; 18(Suppl. 1): S81-5. Akpan A, Morgan R. Oral candidiasis. Postgrad Med J 2002; 78(922): 455-9. Fukushima C, Matsuse H, Tomari S, et al. Oral candidiasis associated with inhaled corticosteroid use: comparison of fluticasone and beclomethasone. Ann Allergy Asthma Immunol 2003; 90(6): 646-51. Terai H, Shimahara M. Partial atrophic tongue other than median rhomboid glossitis. Clin Exp Dermatol 2007; 32(4): 381-4. Hagymási K, Tulassay Z. Helicobacter pylori infection: new pathogenetic and clinical aspects. World J Gastroenterol 2014; 20(21): 6386-99. Song Q, Lange T, Spahr A, Adler G, Bode G. Characteristic distribution pattern of Helicobacter pylori in dental plaque and saliva detected with nested PCR. J Med Microbiol 2000; 49(4): 349-53. Li C, Musich PR, Ha T, et al. High prevalence of Helicobacter pylori in saliva demonstrated by a novel PCR assay. J Clin Pathol 1995; 48(7): 662-6. Amiri N, Abiri R, Eyvazi M, Zolfaghari MR, Alvandi A. The frequency of Helicobacter pylori in dental plaque is possibly underestimated. Arch Oral Biol 2015; 60(5): 782-8. Sanchez MR. Infectious syphilis. Semin Dermatol 1994; 13(4): 234-42. Leuci S, Martina S, Adamo D, et al. Oral Syphilis: a retrospective analysis of 12 cases and a review of the literature. Oral Dis 2013; 19(8): 738-46. Vakil N, van Zanten SV, Kahrilas P. The Montreal definition and classification of gastroesophageal reflux disease: a global evidence-based consensus. Am J Gastroenterol 2006; 101(8): 1900-20. quiz 43. Farrokhi F, Vaezi MF. Extra-esophageal manifestations of gastroesophageal reflux. Oral Dis 2007; 13(4): 349-59. Petruzzi M, Lucchese A, Campus G, Crincoli V, Lauritano D, Baldoni E. Oral stigmatic lesions of gastroesophageal reflux disease (GERD). Rev Med Chil 2012; 140(7): 915-8. Scully C, Beyli M, Ferreiro MC, et al. 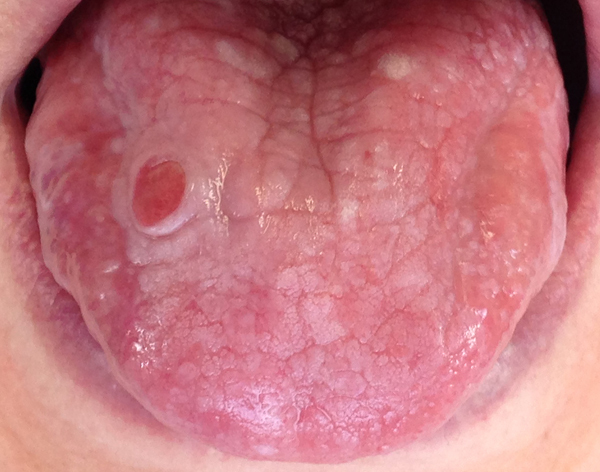 Update on oral lichen planus: etiopathogenesis and management. Crit Rev Oral Biol Med 1998; 9(1): 86-122. Thorn JJ, Holmstrup P, Rindum J, Pindborg JJ. Course of various clinical forms of oral lichen planus. A prospective follow-up study of 611 patients. J Oral Pathol 1988; 17(5): 213-8. Xue JL, Fan MW, Wang SZ, Chen XM, Li Y, Wang L. A clinical study of 674 patients with oral lichen planus in China. J Oral Pathol Med 2005; 34(8): 467-72. Bello IO, Soini Y, Salo T. Prognostic evaluation of oral tongue cancer: means, markers and perspectives (I). Oral Oncol 2010; 46(9): 630-5. Bello IO, Soini Y, Salo T. Prognostic evaluation of oral tongue cancer: means, markers and perspectives (II). Oral Oncol 2010; 46(9): 636-43. Jones AS, Rafferty M, Fenton JE, Jones TM, Husband DJ. Treatment of squamous cell carcinoma of the tongue base: irradiation, surgery, or palliation? Ann Otol Rhinol Laryngol 2007; 116(2): 92-9. Riley CM, Day RL, et al. Central autonomic dysfunction with defective lacrimation; report of five cases. Pediatrics 1949; 3(4): 468-78. Mass E. A review of the oro-dento-facial characteristics of hereditary sensory and autonomic neuropathy type III (familial dysautonomia). Spec Care Dentist 2012; 32(1): 15-20. Johnson RH, Spaulding JM. Disorders of the autonomic nervous system. Chapter 5. Arterial hypertension. Contemp Neurol Ser 1974; (11): 57-78. Zhu JF, Kaminski MJ, Pulitzer DR, Hu J, Thomas HF. Psoriasis: pathophysiology and oral manifestations. Oral Dis 1996; 2(2): 135-44. Fortuna G, Lozada-Nur F, Pollio A, et al. Patterns of oral mucosa lesions in patients with epidermolysis bullosa: comparison and agreement between oral medicine and dermatology. J Oral Pathol Med 2013; 42(10): 733-40. Wright JT. Oral manifestations in the epidermolysis bullosa spectrum. Dermatol Clin 2010; 28(1): 159-64. Krämer SM, Serrano MC, Zillmann G, et al. Oral health care for patients with epidermolysis bullosabest clinical practice guidelines. Int J Paediatr Dent 2012; 22(Suppl. 1): 1-35. Wright JT, Fine JD, Johnson LB. Oral soft tissues in hereditary epidermolysis bullosa. Oral Surg Oral Med Oral Pathol 1991; 71(4): 440-6.
 Zimmer WM, Rogers RS III, Reeve CM, Sheridan PJ. Orofacial manifestations of Melkersson-Rosenthal syndrome. A study of 42 patients and review of 220 cases from the literature. Oral Surg Oral Med Oral Pathol 1992; 74(5): 610-9. Winnie R, DeLuke DM. Melkersson-Rosenthal syndrome. Review of literature and case report. Int J Oral Maxillofac Surg 1992; 21(2): 115-7. Feng S, Yin J, Li J, Song Z, Zhao G. Melkersson-Rosenthal syndrome: a retrospective study of 44 patients. Acta Otolaryngol 2014; 134(9): 977-81. Kanerva M, Moilanen K, Virolainen S, Vaheri A, Pitkäranta A. Melkersson-Rosenthal syndrome. Otolaryngol Head Neck Surg 2008; 138(2): 246-51. Ozgursoy OB, Karatayli Ozgursoy S, Tulunay O, Kemal O, Akyol A, Dursun G. Melkersson-Rosenthal syndrome revisited as a misdiagnosed disease. Am J Otolaryngol 2009; 30(1): 33-7. Elias MK, Mateen FJ, Weiler CR. The Melkersson-Rosenthal syndrome: a retrospective study of biopsied cases. J Neurol 2013; 260(1): 138-43. Guggenheimer J, Moore PA, Rossie K, et al. Insulin-dependent diabetes mellitus and oral soft tissue pathologies: II. Prevalence and characteristics of Candida and Candidal lesions. Oral Surg Oral Med Oral Pathol Oral Radiol Endod 2000; 89(5): 570-6. Guggenheimer J, Moore PA, Rossie K, et al. Insulin-dependent diabetes mellitus and oral soft tissue pathologies. I. Prevalence and characteristics of non-candidal lesions. Oral Surg Oral Med Oral Pathol Oral Radiol Endod 2000; 89(5): 563-9. Simonsen JR, Harjutsalo V, Järvinen A, et al. Bacterial infections in patients with type 1 diabetes: a 14-year follow-up study. BMJ Open Diabetes Res Care 2015; 3(1): e000067. Wysocki GP, Daley TD. Benign migratory glossitis in patients with juvenile diabetes. Oral Surg Oral Med Oral Pathol 1987; 63(1): 68-70. Shulman JD, Carpenter WM. Prevalence and risk factors associated with geographic tongue among US adults. Oral Dis 2006; 12(4): 381-6. Gómez-Moyano E, Martínez-Pilar L, Pérez-Belmonte LM, Godoy-Díaz DJ. Erythema and atrophy on the tongue. Cleve Clin J Med 2014; 81(9): 523-4. Jainkittivong A, Langlais RP. Geographic tongue: clinical characteristics of 188 cases. J Contemp Dent Pract 2005; 6(1): 123-35. Demir N, Doğan M, Koç A, et al. Dermatological findings of vitamin B12 deficiency and resolving time of these symptoms. Cutan Ocul Toxicol 2014; 33(1): 70-3.